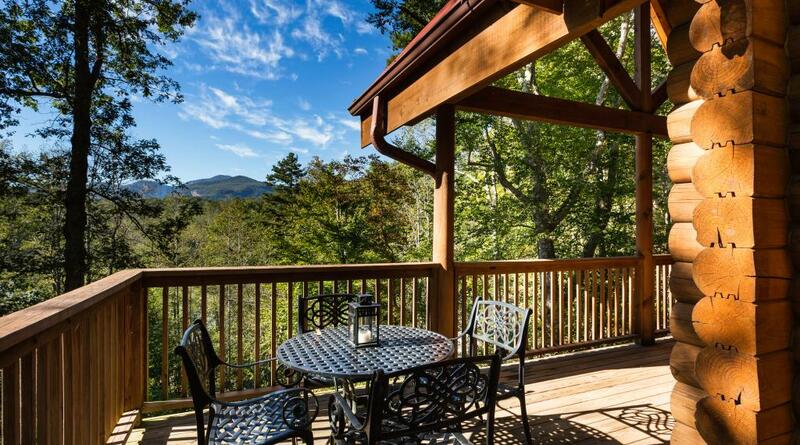 "Grand View" is a beautifully maintained 3 bedroom, 3 bath, log cabin with awesome views of the Bald Mountains, and winter views of Big Mirror Lake, all located in the heart of Lake Lure, North Carolina. This home is located in the private gated community of Riverbend. You will have access to enjoy all the amenities of Riverbend at Lake Lure: Mirror Lake, the covered picnic site is complete with picnic tables, rocking chairs, stone fireplaces, restrooms and spectacular views, and beach area, the Broad River Old Swimming Hole, walking trails, and seating by the waterfall and along the Broad River. The fishing is excellent and there is a bait shop right across the street. Deer and wild turkey are sited regularly. 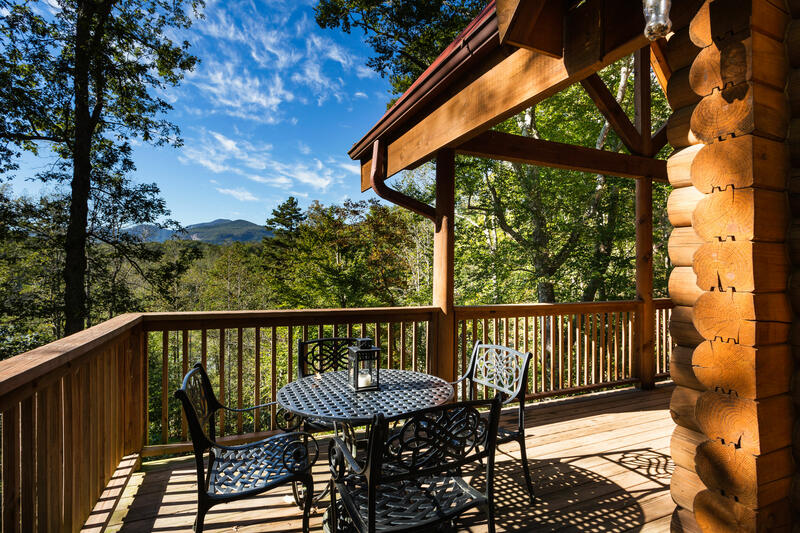 Western North Carolina offers a number of entertainment and activity options as well as some of the most beautiful views you will ever see. The main floor boasts the living room with upper deck access, a cathedral ceiling, wood burning fireplace, comfortable sectional couch, DVD, WI-FI, and Direct TV with flat screen TV. The sunny dining room seats 6 comfortably with access to the deck. Cook to your hearts content in this well-appointed stocked kitchen. Maybe just a simple breakfast, lunch, or preparing the families favorite dinner. Also on main level is the Master Bedroom with King Bed, private full bath with shower only, and dual sinks. Stacked washer and dryer located just off master. Head upstairs and you’ll find the Loft with 2 single beds, Guest bedroom with King Bed. A Jack n Jill full bath serves this area. Head downstairs and you’ll find a comfortable family room. Enjoy the game on a flat screen TV with Direct TV, comfortable couch, games, toys, puzzles, and access to the lower deck. Enjoy family tournaments on the Foosball table . This level also boasts Guest bedroom with King Bed, access to lower deck, and full bath. Let’s go outside and enjoy the large open and covered wrap around main deck. Dine el fresco; enjoy the morning sunshine with coffee and a book. Enjoy the rocking chairs, bench, or porch swing. The lower deck has a small table and chairs. There is also a small patio area in the yard to enjoy the mountain air. Look around and don’t be surprised to see deer, assorted birds, rabbits, and wild turkey. Propane grill provided for the grill master. Gaze up at the spectacular night stars. The stairs lead from the cabin down to a leisurely walk to the pavilion and beach area. The stairs are gently sloped as they are built into the hillside. Hardwood floors throughout and wood walls give this home a warm, feeling you can only find in a log cabin. No matter what time of the year you choose, you will feel right at home at Grand View.